Two great navigational apps from two different companies. HERE WeGo was previously known as Here Maps, and it is currently owned by multiple brands and Waze which is now owned and operated by Google. Both are great, and both have lots of unique features which make both apps quite a competitor. How do both apps stand against each other? 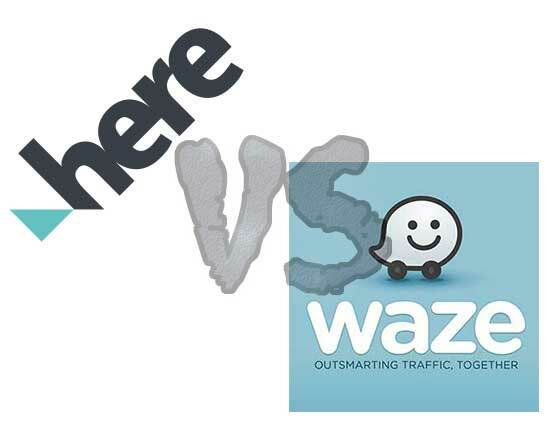 Let’s find out in the final battle of HERE WeGo vs Waze. You can watch the below video on HERE WeGo vs Waze. The video explains how both work on the road and how do both maps react in busy traffic and changing of the route. None of any apps is perfect and in HERE WeGo vs Waze comparison, we saw something similar. Move on to see the technical comparison. HERE WeGo is a maps and navigation app for Android and iOS. Web mapping service for desktops is also available. Here WeGo was originally developed by Nokia in 2012 for Windows Phone. Over 10 million users have downloaded the app only on Android. Waze was first released in 2006, and then Google acquired the company in 2013. The app is available to download on iOS and Android. Waze comes with some of the great features which other maps apps do not provide. Over 100 million users have downloaded Waze only on Android. Both use AI and satellites to track the traffic, but both have different algorithms to figure out the best route. Waze prefer street and try to ignore the traffic lights, but HERE WeGo gives the fastest way possible. Waze also uses the information provided by the users and shows if a road is busy. Once we put the address in HERE WeGo, it displays the location with a “Directions” button. Tapping on the button shows all available routes. You can select the car, public transport, any rideshare services, taxi, cycle and walk. You can also choose the option to give the best available route including all the methods to get to the location. Once the route is selected the screen with options comes up. Also check out: Waze vs Google Maps. Waze only allows private vehicles, taxi or cycle. After the user enters the address, an overview of the trip including the address, significant roads, travel time, distance and arrival time comes on the screen. Tapping on Go Now starts the journey. HERE WeGo uses light colours for the map and pink and yellow for roads and streets. Waze, on the other hand, uses light colours and black colour for roads and streets. Both have a search bar on the top with the current location on the bottom right corner. Both feature a dark mode which can be turned on at any time or you can leave that to auto. HERE WeGo comes with an option to select the map view like satellite, transit, and traffic. Like Google Maps, HERE WeGo allows choosing transit options. Users can choose from a private vehicle to public transport, taxi, rideshare, cycle and walking route. Some of the options might not be available in offline mode. Waze, on the other hand, does not come with any public transport options but it comes with three options to select including private vehicle, taxi or cycle. Waze also comes with an option to change the map view to 2D, 3D, or leave that to auto. Check out: Waze vs Google Maps. These days the data is vital for essential tasks like Facebook and Instagram 😜. HERE WeGo allows downloading maps for different areas. Depending on your location, you can download your city, state or even the whole country’s map. It comes handy when you are in remote areas, or you don’t have enough data left. The app will not be able to give you traffic updates, but it would give you the easiest route. Waze does not allow to download maps on your phone, but it if the internet goes off while in a route, the app would not stop working. Check out: Best Android Apps for your Health. HERE WeGo reports current vehicle speed, current speed zone, safety camera, and traffic. Waze is a community-based application where users can report from traffic to police, crash, hazard, gas prices, map issues, places, camera, closure and more. Another feature in Waze is it warns the driver not to use the maps while the vehicle is in motion. A passenger can tap on the “Passenger” button to override the message. Other than that, safety camera reporting in Waze is better than HERE WeGo. Waze displays the location of the camera by highlighting the map and reminding the driver, while HERE WeGo sometimes warns with the voice or sometimes it beeps if a camera is ahead. HERE WeGo does not display the camera on the map. HERE WeGo comes handy regarding the information about the shops. In HERE WeGo we can see the details like opening hours, website, phone number etc. for different places. HERE WeGo is not as good as Google Maps, but they are working to make HERE WeGo an app for everyone to find the information for any business. Waze uses a scoreboard system where users can contribute to maps and see their contributions. A user can earn proper respect by reporting the information including cameras, police, crash, traffic etc. The more you share the respect you get. Tap on “Scoreboard” button in your profile settings to see your level, score and rank. You can see your level on the screen and all time points. In “My Achievements” menu you can see all your achievements including milestones, reports etc. Not all the reports are updated straightaway although you can keep reporting to receive the score. HERE WeGo does not come with any contributions in the app, but you can go to their website and edit the map. Check out: Google Keep vs OneNote or Sygic vs Google Maps. Which one is better where? The answer to this question is difficult to answer. Here is what I think about both apps. If you prefer the streets and want to avoid the roads, then Waze would be your choice. Going toward a new location? Waze is your buddy. If you are thinking about finding the cheapest possible way, then HERE WeGo can give you information about public transport. For a known location, you can choose either, because both will get you there. Public transport? HERE WeGo is there. For shopping, I would suggest HERE WeGo because you can see the business information before leaving. I hope the comparison HERE WeGo vs Waze gave an idea about both the apps. No matter what you select, both apps will get to the destination and depending on the traffic condition either can give you the best route. If you want to be safe from fines, then Waze would be your app, but for public transport and businesses details, HERE WeGo is better. Image information: Images used in this article are the screenshots of the apps. A screenshot is most likely the copyright of the app owner. If you have any concerns about the images, please contact me. Last updated: 04/04/2019. Next Article Microsoft Launcher vs Smart Launcher 5 – A Perfect Android Launcher? Thanks for the comparison. Now I know when to use Here WeGo and when to use Waze. I use HERE WeGo. It’s because I’m a fan of Nokia. Here Maps has great options like saving maps offline etc. There is no comparison. Waze is the choice. It’s your choice. Thanks for the feedback. another point in comparison. Here WeGo has an app for Galaxy Gear watches while waze does not. If you want to get/view navigation on your Samsung watch then Here is the choice. BTW how are you defining road vs street?